The Problem with Fair Trade USA-Certified Coffee | Small Farmers. Big Change. TransFair/Fair Trade USA walking away with the fruits of 25 years of the movement’s collective labor, to the detriment of small farmers & consumers. If you are new to Fair Trade, or quite understandably, are just still confused about what the big fuss is when people talk about the Fair Trade controversy, the “split in the movement”, or the betrayal of small coffee farmers, this very brief, compelling, an easy-to-follow article by Nicki Lisa Cole and Keith Brown should help clear away the clouds. Cole and Brown “interviewed fair trade store owners, coffeehouse managers and baristas, importers and exporters, coffee industry consultants, cooperative and movement leaders, farmers, artisans, and consumers,” and combine this with their own research and analysis to provide their account of what went wrong when Transfair USA (now Fair Trade USA) left the international Fair Trade system and begin certifying plantation coffee. Sadly, the actions of Fair Trade USA now make it necessary for informed consumers to think twice when they take a Fair Trade certified product off the grocery shelf: Does this product support democratic small farmer organizations or large multinational companies & plantation owners? Many people purchase fair trade certified products because they trust that doing so makes a difference in the lives of small producers around the world. Sociologists Nicki Lisa Cole and Keith Brown discuss how changes to certification policy have modified the meaning of fair trade in a way that has troubling implications for small coffee farmers. Cartoon courtesy of John Klossner. Copywrite 2012. Your certifier, IMO, has always allowed large farmers/plantations/estates for coffee (and cacao). Fairtrade Int’l (FI) also allows large farms in most crops. Therefore, why do you criticize Fairtrade USA for opening coffee certification to large farms, but tacitly condone FI and use IMO as your certifier? (FI’s mass balance and ingredient-based labeling policies have further eroded benefits and equity for small farmers.) The history of FI also indicates it was founded by Europeans. Can you please explain the role of small producers in creating the Fairtrade label/system? Thank you. Thanks for taking the time to write and for your questions. 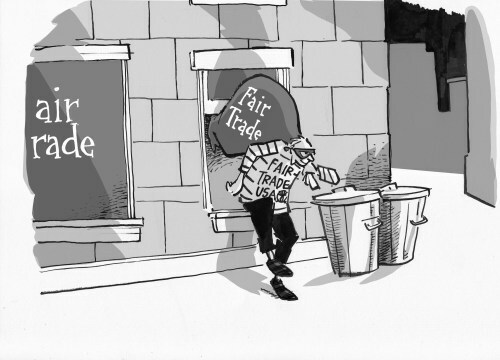 Many of the reasons we have criticized Fair Trade USA are actually mentioned in the article cited here on today’s blog. Rather than go through them again, I would suggest you read this article, written by independent researchers, Nicki Lisa Cole and Keith Brown. Equal Exchange worker-owners have also shared a variety of viewpoints about this topic in other articles throughout this blog. For starters, please read “To Tell the Truth: Who Owns Fair Trade?” (https://smallfarmersbigchange.coop/2011/02/01/to-tell-the-truth-who-owns-fair-trade-2/) or Rink Dickinson’s three part analysis on Fair Trade (https://smallfarmersbigchange.coop/2011/10/23/4269/). In his article, and in many others written by members of Equal Exchange, founder and co-president Rink Dickinson also critiques Fairtrade International for allowing plantation tea, banana, and other products into the fair trade system. Again, rather than repeat these arguments, I suggest you read his analysis of what is wrong with plantations in the Fair Trade system. You can also find numerous critiques on our blog by Santiago Paz (https://smallfarmersbigchange.coop/2012/03/25/4739/) and other representatives of small farmer co-ops, just one of which can be found here (https://smallfarmersbigchange.coop/2011/12/15/mexican-small-farmer-fair-trade-producers-speak-out-we-can-only-move-forward-with-authentic-fair-trade/). Finally, regarding the historic role of small coffee producers in the establishment of fair trade certification, my understanding is that UCIRI in Mexico joined up with a solidarity organization in the Netherlands to create Max Havelaar, the first Fair Trade certification body to begin using an identifying label.